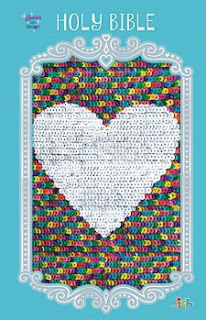 The Sequin Sparkle and Change Bible is sure to be a hit with girls! This fabulous material is on everything from pillows to T-shirts. The "mermaid" sequins change color right before your eyes. Girls will love the design and will want to carry the Sparkle and Change Bibles with them everywhere! This Sequin Sparkle and Change Bible features rainbow sequins that change color depending on which way your child swipes. It’s double the fun! It’s perfect for kids ages 6 to 10 to take to Sunday school, read with the family, or study on their own. I saw this and I knew I needed to review a copy because what little girl would not LOVE the sequins that changes when you push up or down! This is such a craze right now on folders, shirts, notebooks, pillows! This Bible is ICB translation. It is a large and easy to read Bible for kids! We love the section that you can keep your favorite Bible Verses but wish there were more pages for that! We also like the small articles that bring a lot of encouragement to younger readers. I love that we can find a Bible that will help kids want to bring it with them where ever they go! This sequin sparkle one is sure to put a smile on your kids face! The feature that we also started to utilize was "The Miracles of Jesus!" We thought it would be a great faith builder to start reading Jesus' miracles. It was good practice for the kids to find the right scripture and read about the power of Christ! This would make a great Valentines gift with the heart shape sequin cover! :) Help your young one start a love for reading their Bible!